Are you new to Edmonton? Or do you know someone who is new to our city? Whether you’re from Calgary or China, Toronto or India, the City of Edmonton provides a number of services to help newcomers feel welcome and settle into Edmonton more quickly. Visit City Hall for information about Edmonton. Assistance is available in over 150 languages. Discover the services and programs available for newcomers to Edmonton. A comprehensive list of City services for residents. Gives low income Edmontonians free use of City of Edmonton recreation facilities and attractions. We support ethnocultural groups in finding information, and coordinating programs and events. Find out how to register for the Alberta Health Care Insurance Plan. The Edmonton Public Library (EPL) has many free services, resources and materials to help you transition to and enjoy life in Edmonton. The Edmonton Police Service (EPS) is helping the city’s growing multicultural communities understand the role of police with a handbook that is available in 16 languages. 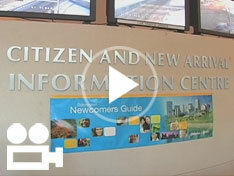 Edmonton welcomes newcomers to our city, whether visitors or new residents. Created and dubbed in Arabic by the Government of Canada, this video helps newcomers prepare for life in Canada.